Dule Temple (独乐寺) was named after the gurgling spring behind it. It is situated near the Western Gate of Jixian County, Tianjin Municipality. Most of the temple buildings were ruined during the 841-846 reign of Emperor Wuzong of the Tang Dynasty, who pursued a policy of cracking down on Buddhism. 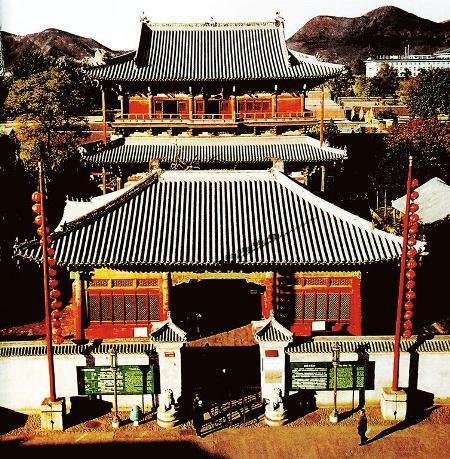 Some of the buildings were restored in 984 (2nd year of the Tonghe reign, Liao Dynasty), and more buildings were added during the Ming and Qing dynasties. A major attraction of the Dule Temple is a 16-meter-tall statue of the Goddess of Mercy in the finely crafted image of a lady who looks graceful and composed despite her awesome stature. This is reputedly representative of the very best of Liao sculpture. The pavilion that shelters this statue is a stately 23-meter-high building under a roof with three-layered eaves. The pavilion’s four walls are graced with lifelike, life-sized murals. - Hours: 7:30 a.m. – 6:30 p.m.
take a bus from Beijing Sihui Bus Station to Jixian County (costs 19 yuan/person) and then takea tricycle to Dule Temple.